You should arrive on November 9 and depart on November 20. PHOTOGRAPHERS WHO WANT TO TAKE GREAT SHOTS AND LEARN HOW TO DO SETUPS! Setups are an important skill for the nature photographer, especially so in the tropical forest. Greg and Glenn share the techniques that help them get some of their favorite images. Glenn’s images are well respected and represented around the world. He is an award winning photographer whose work is regularly featured in North American and Internationalnature books, calendars and publications. Glenn’s work is regularly featured in magazines such as Audubon, Birdwatching, Canadian Wildlife, Birders World, and many more. His images regularly appear in books on birds including several by National Geographic. Glenn has also published several books of his own including "Birds of Ecuador", "Birds of Vancouver Island" and "Birds of Biritish Columbia" as well as instructional guides on Post ProcessingFlash and Tropical Nature Photography Techniques. Check out Glenn's website to see more of his work. Greg and Glenn will be with you every step of the way to help you to hone your nature photography skills. After an early breakfast, we check out and head to our first destination, a rainforest lodge where Greg has worked to set up a feeder that offers unparalleled opportunities to photograph keel-billed toucans, chestnut-mandibled toucans, and brown-hooded parrots among many other birds. We arrive at the lodge for lunch and set in immediately to photograph at the feeders! This evening, Greg and Glenn will give a presentation on fill-flash for bird and wildlife photography. Today we divide our time at the lodge among photographing toucans, parrots, king vultures, honeycreepers, and hummingbirds – tropical bird photography doesn't get any better! Today we will split the group with half using blinds for toucans, oropendolas, and vultures that we've rented for the day and the other half shooting at our restaurant tanager and parrot feeders and visiting the lodge manager's house where we have worked with the lodge manager to set up two blinds – one for honeycreepers and one for a multiple-flash hummingbird setup where you will have the opportunity to photograph lowland hummingbird species including crowned woodnymph, white-necked jacobin, green-breasted mango, scaly-breasted hummingbird, and long-billed hermit. And today we do it all again, with each half of the group visiting the blinds at which they've not yet photographed. Today we work on more setups at our lodge but we focus our attention on some other species that really deserve our attention. We'll put our efforts on the chestnut-colored woodpecker, great curassow, and others during the day. And at night, we have a special treat – bat photography with multiple flashes! After an early breakfast, we travel to the Arenal Volcano area. Though currently experiencing a lull in activity, until recently Arenal had been the country's most active volcano, with continuous emissions of lava and incandescent pyroclastic flows since the beginning of the recent active cycle in 1968. On clear nights, the views of incandescent avalanches can be breathtaking. Hopefully it will become more active again soon but that, of course, is beyond our control. En route to Arenal, we stop for lunch and then a private nature reserve to photograph caimans, boat-billed heron, and butterflies, among other possible subjects. We arrive at our lodge in the afternoon and, after check-in, photograph the sunset over Lake Arenal. This morning we roam the hotel grounds in search of wildlife to photograph, including monkeys, crested guan, and collared aracaris. We also will take time to photograph the numerous Montezuma oropendolas at the lodge feeders. Later this morning, we depart for a nearby spot with an amazing collection of frogs, snakes, and lizards. This place is run by one of Greg's friends, and the staff there will help us to photograph these colorful animals on natural stages that we will set up on site. This is a great opportunity to photograph a number of species that are very difficult to find in the wild and also to continue our work on creative lighting for pleasing macro images. We will enjoy a delicious home-cooked lunch as well as refreshments and coffee throughout the day. We return to our lodge in late afternoon to photograph the sunset and the Arenal Volcano. After an early breakfast, we travel to the higher cloud forests of the northern Central Volcanic Mountain Range and our last lodge and photography base for the rest of our trip. Our lodge is located in one of the most biodiverse areas of the country, nestled in a picturesque valley at approximately 4,500 feet above sea level. With its rushing mountain streams, cool air, and orchid and moss-festooned trees, the area is akin to a tropical Colorado. En route, we stop at a local farm where Greg has worked to set up photo opportunities of the wild, free-flying great green and scarlet macaws that inhabit the owner's large farm property. Upon arrival to our lodge, we can photograph tanagers and black guan in the new feeder areas that Greg has set up on the lodge grounds or explore the cloud forest for macro and landscape photos. This evening, Greg will do a presentation on the technical and artistic aspects of multiple-flash hummingbird photography. After breakfast today, we set in immediately to begin photographing hummingbirds at our multi-flash setups right on the lodge grounds. We will concentrate on the violet sabrewing (Costa Rica’s largest species), green hermit, purple-throated mountain gem, and green-crowned brilliant. Greg will run the setups and provide attractive native flowers to ensure that you capture some fantastic hummingbird images. Greg's company, Foto Verde Tours, is the only company that has permission to do multi-flash hummingbird photography at this lodge. When not on the setups, you can relax and download images, shoot the black guans, tanagers, agouti, and coatimundi, or explore the cloud forest trails for macro and landscape photography. After breakfast, we visit a nearby waterfall, which is 110 meters high and offers beautiful photographic opportunities of the waterfall itself and the surrounding cloud forest. There are some absolutely world-class landscape and lush tropical foliage images to be made here. In addition, we have permission to set up our multiple-flash here to take advantage of some very interesting small hummingbird species such as black-bellied hummingbird, coppery-headed emerald, and green thorntail. We'll shoot throughout the day, alternating our time between the setups, perched hummingbirds, and landscape photography. After more morning photography around the lodge grounds and feeders, we have lunch and then pack up and leave for San José. En route, we stop at Greg B's hometown for some HDR photography of the beautiful church and park. We arrive at our hotel in the late afternoon, we have a bit of time to relax and photograph in the fantastic hotel gardens before enjoying a farewell dinner at the hotel. Again, our hotel offers free wireless Internet throughout the grounds and in the rooms and also offers some great macro and nice bird photo opportunities for those departing later the following day. You can also pay your airport exit tax right at the front desk, a great convenience. Did you know that the Violet Sabrewing is the largest hummingbird outside South America? We'll be getting great shots of the giant purple beauty on this workshop! 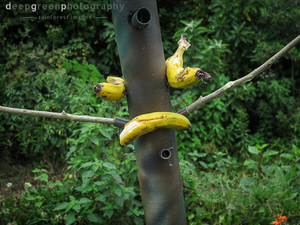 Click the pic above to see how Greg Basco's DIY tropical bird feeder.